A stunning sun-loving shrub with clusters of tubular-shaped flowers in various gorgeous colors, mostly from vibrant orange to scarlet, blooming all year round in our tropical country, Malaysia. We’ve been growing the cultivar ‘Salmon’ with beautiful brilliant orange blooms since late 2005, first on the ground and then transplanted to a container when we found that the roots were rather invasive. Poor thing, it did not survive the stress as a portion of its roots had to be severed. Plant type: Ornamental perennial shrub or quasi-climber, native to Mozambique, South Africa and Swaziland. Now widely cultivated elsewhere in the tropics and subtropics. 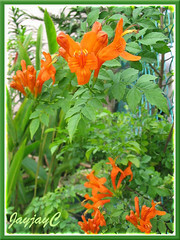 Features: Tecoma capensis is the only indigenous South African species out of approximately 12 species of the genus Tecoma, with the rest originating from Arizona to the Andes in South America. Like the Podranea ricasoliana, it is a rapid-growing rambling shrub with long stems, or quasi-vine (vine-like) reaching 6 meters tall or more with support and spreads as wide or even wider if unchecked. With age, it can become woody and straggly if unpruned. It has fairly invasive root system below. Foliage is wonderfully evergreen in warmer regions but semi-deciduous to deciduous in colder regions. Glossy green-colored leaves are pinnately compound, with opposite pairs of ovate to roundish leaflets that are 2-5 cm long and have coarsely serrated margins. Cape Honeysuckle is a prolific bloomer that flowers all year round in tropical conditions, and from late summer to winter in colder climate. It starts blooming when young, bearing 5-6 cm long tubular-shaped flowers in fairly large clusters at terminal stems, held above the foliage. Colors vary from brilliant orange to scarlet or reddish-orange, light yellow to apricot and salmon, in marvelous contrast with its medium to dark green foliage. Inedible fruits are produced in long and narrow seed pods up to 25cm in length, containing many winged seeds and will split open when fully ripe to self-sow readily. 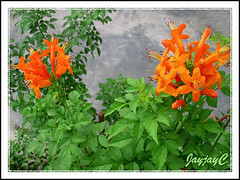 Culture (Care): Tecoma capensis can be easily planted without much maintenance, though pruning is something it cannot do without. Soil: Fairly moist and compost-enriched soil that must be well-drained. It is adaptable to poor, sandy soil and tolerates salt spray. Others: It can take hard pruning. Prune regularly after flowering to control size and reshape into a shrubby bush, as well as to encourage new growth and abundant flowering. As a climber, its stems and branches need staking or tied to a support. It benefits from a monthly feed with a balanced fertilizer. No serious pests or diseases. For temperate regions: Hardiness: USDA Zone 9-11. Need protection in frosty areas. It will bounce back from the root system in warmer climate even though killed in winter. Prune back in late winter or early spring to promote new growth and flowers. Propagation: Easily by seeds and semi-hardwood cuttings or layering which it does naturally. Low-growing branches will root easily when in contact with soil and can be severed to start new plants. In the warmer tropics, propagation can be done anytime but in cooler climates, seed should be sown in spring or during summer, as with cuttings and layering. Usage: Excellent as an ornamental flowering shrub for hedges and screens, especially over chain-link fences or espaliered on a wall or cascade down a garden wall. Suitable to be trained as a climbing vine with support at porches, trellis and arbors. Its vigorous and sprawling growth habit makes it ideal as a ground cover, covering vast areas especially on steep slopes and rocky banks. Ideal too for xeriscaping or seaside plantings. It can be grown in a large container as a specimen shrub outdoors or overwintering indoors in frosty regions and for greenhouses. 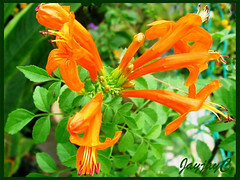 Cape Honeysuckle can be planted to attract hummingbirds, butterflies and bees to one’s garden. Its powdered bark is known to be used as a traditional medicine to relieve pain and sleeplessness. I planted one of these where I live in southern France three years ago and it’s first attempt at flowering was this November! Almost winter here but we’re having a mild spell (18°-19°C). Just wonder why it wouldn’t flower in the summer? Still, it really is beautiful and passers-by look over the wall and pass on their compliments, almost the last flowering shrub in the village. 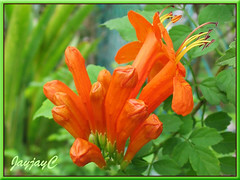 If you possible please send me information prodution seeds plants and price list specialy Tecoma capensis. Sorry, masoud! We’re not a retail garden nursery…we do not offer seeds or plants for sale. Hi I just bought one of these plants yesterday and have planted it on my balcony, in Malta. I hope the winter climate will be ok for it. It already has beautiful orange flowers and I hope I can train it to climb up my trellis. All the best to you, Triona! I am truly amazed by this site and have no words to express myself. Your dedication and passion is boundless and your garden too is simply amazing!! Hi Nimmy! Such sweet compliments is music to my ears! Thank you so much… you’ve made my day! Need to know if poisonous to horses? Hi, I have a Cape Honeysuckle that I have drastically reduced for bonsai purposes and was wondering if you have any info concerning root prunning as I want to put it in a much smaller container. It is still in the original 5 gallon pot that I purchased it in a couple years ago and I am looking to reduce the root mass by about 50% for the initial repot. I am rather experienced doing things of this nature and the tree is very happy and healthy, however I am aware of several troicals that do not respond well to drastic reduction of the rootball. Any thoughts for me? Thanks in advance. Having failed occasionally in the task of root pruning for our plants, we feel somewhat incompetent to advise you on this matter. Instead, we’d like to suggest that you browse through articles about bonsai that included one on root pruning at Evergreen Gardenworks for more insights. First Jacqueline, you have a very great site. The Internet has made the world a neighborhood. I am in Arizona, USA & I see many places here. My question: what happens if you over water cape honeysuckle? Sorry for a unclear question. I have a cape honeysuckle still in the black plastic nursery pot. When I brought it home the leaves were beautiful & standing out nicely. Now they are striveled. Sort of like they are underwatered. However, I am thinking that we over watered them. We have 100 degree F tempature days. Thanks for the thumbs up on our site, David! We appreciate that very much. We’ve observed that over-watered plants may have the same shriveled or wilted leaves as under-watered plants. I think you’d be the best person to know whether you had over- or under-watered your plant in relation to the extreme temperature at your region, and act accordingly. Sorry I’m unable to advice further. However, you may want to browse through this article about watering plants in Arizona as a guide. Ik heb een tecomaris gekocht in een pot. Ik heb die nu verplant met extra voedingsmiddel in een grotere terraspot. Zou dit lukken, of moet hij in volle grond worden verplant? Waarop moet ik letten? Mag ik hem als hij niet bloeit bijsnoeien? Hi Marjan! This plant is rather versatile and can be grown either in a large pot or on the ground. Regarding plant culture and care, please refer to the article above. May your plant reward you with numerous blooms. Is cape honeysuckle harmful to dogs if leaves are eaten? Sorry Sandra, we really don’t know. Please google elsewhere for answers. Does anyone know if the flowers of Tecoma Capensis are edible? I have many on my smallholding and if edible, could be an attractive addition to salads.